Historically, many cities were built around heavy industry. The production of steel and textiles was the catalyst for urban growth during the industrial revolution, and through the twentieth century, other kinds of heavy industry fueled the development of major cities around the world. Detroit, for instance, became the center of car manufacturing in the USA, while the English city of Manchester grew wealthy through its key role in the textile industry. However, in the latter part of the twentieth century, the nature of many of these cities and regions changed. For various reasons, industrial production has declined. Sometimes the key industries have relocated to cheaper areas. More recently, countries are making concerted efforts to address climate change by moving away from fossil-fuel based industries entirely. With the decline of heavy industry come job losses. Without the attraction of jobs, people are likely to emigrate from the city or region, which risks entering a spiral of decline. The abandoned Packard Automobile Factory in Detroit. Photo by Albert duce via Wikimedia. Some cities and regions have struggled to find their way out of this spiral. 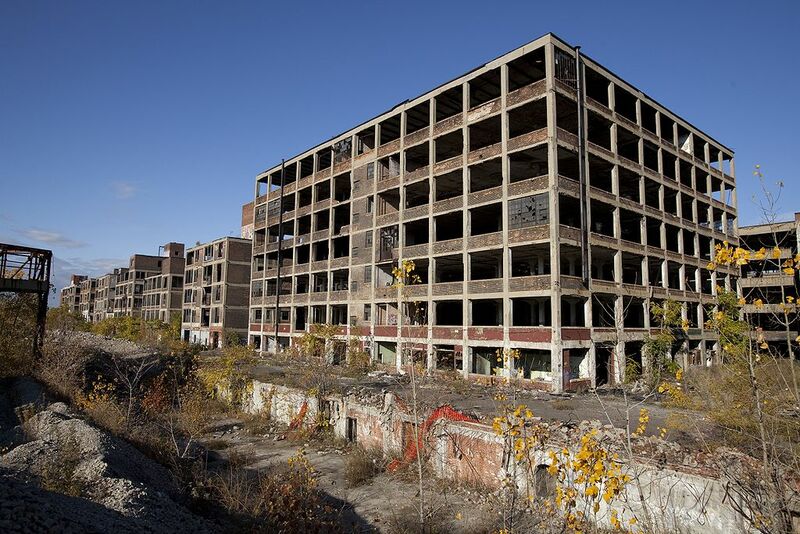 In July 2013, Detroit – once one of the richest cities in the world – declared bankruptcy. However, other cities and regions are creating brighter futures from an industrialized past. Doing so requires decisive action to reorient the economy towards sustainability and green energy, two areas that are growing rapidly and will only continue to grow. One of the regions engaged in this transition is the Ruhr Metropolitan Region, which recently joined ICLEI. A major European conurbation, the region has over five million inhabitants. Historically its economy has been based around coal mining and the production of iron and steel. When the demand for these products began to deteriorate, the region initially responded with economic rather than structural measures, designed to revive the dominant industries. However, in recent years the region has made a decisive break with the past, implementing policies and projects that will orient the region towards sustainable long-term growth. It’s a strategy known as “Wandel als Chance”: Change as Chance. The strategy focuses on integrated project development under three themes: City, Climate and Education. One strand is the coordinated redevelopment of former mines. As this is an issue that affects the entire region, cities have come together with businesses and NGOs to establish a plan for the sites, which offer significant potential for business and industry, leisure and recreation, and housing. The holistic nature of the plan ensures that all of the developments are planned with environmental and social concerns to the fore. In Dinslaken, for instance, a housing project will be centered on a “creative quarter” and will be linked with foot and bike paths. The entire development will be CO2-neutral, thanks largely to the generation of energy from renewable sources. Across the city as a whole, the use of renewable energy, environmentally-friendly local heating and storage technologies will be increased, and a spoil tip will be used to produce biomass. In Gelsenkirchen, the former mining site will be redeveloped to reflect a “New Energy” theme. It will be used as a showroom for the region’s efforts to mitigate and adapt to climate change, in coordination with the region’s larger Klima.Expo – an exhibition that brings together key stakeholders from within the state and beyond and helps the state to work towards its emissions reduction targets. The Gelsenkirchen site will provide opportunities for training and professional development in the sustainability sector, increasing social mobility and fostering a green economy. In Hamm, a more direct transformation is underway. The former mining site will be oriented entirely towards the production of renewable energy, with the installation of solar panels and biogas generators among the planned changes. The city is also considering the possibility of situating energy-intensive buildings in the same area, allowing them direct access to the renewable energy sources to increase efficiency. At the heart of this regional strategy is Essen – the region’s central city, which was recently awarded the title of European Green Capital 2017. Essen has developed a strategy for green growth and sustainability around 12 major themes, including local transport, green urban areas, waste production and management, and sustainable employment. The Emscher river at Dinslaken. Photo by NatiSythen via Wikimedia. 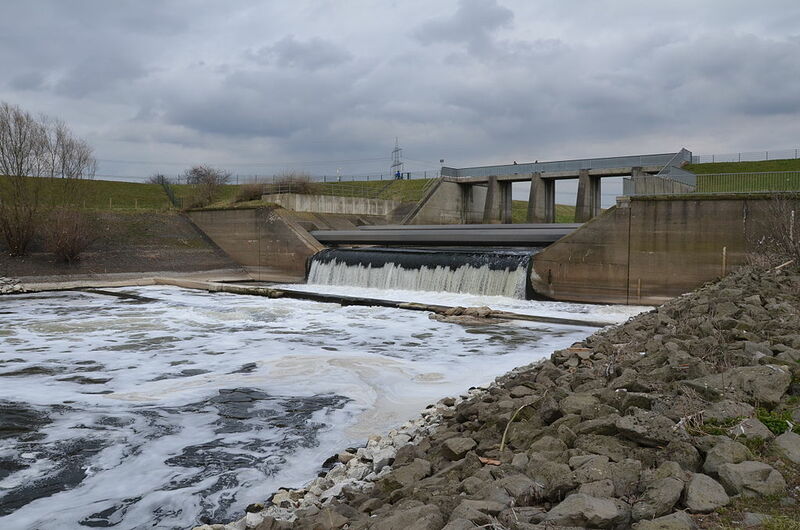 One project of particular note is the rehabilitation of the Emscher river system. While heavy industry has increasingly disappeared from the region, the waste water canals that were constructed to feed it and were subsequently covered with concrete, have remained. Since the 1990s, the region in general and Essen in particular have worked to clean and restructure the system, creating a structure of new canals free of chemical pollutants. One of Europe’s most ambitious regeneration projects, it will be fully operational by 2017 and completed by 2020. The regional “Change as Chance” program has been coordinated by a number of bodies, including the Ruhr Regional Association (Regionalverband Ruhr, RVR), the consortium of Ruhr Cities (Stadtregion Ruhr für 2030) and the business development agency Wirtschaftsförderung metropoleruhr GmBH. In total, there are around 370 cooperative projects in all areas of public life in the 53 cities and four counties. The award of European Green Capital 2017 to Essen shows that this integrated and holistic approach is already being recognized as a model for other regions. The Ruhr Metropolitan Region is seizing the chance for change, and showing how problems can be opportunities for cities and regions with the right mindset and approach.